I think I would rather bake than cook, and with the weather being so cold and snowy lately I have been stuffing my face with all of the above. Is it possible that the cold makes your appetite spike? Who knows? Maybe I like baking better because it is usually sweet, and it requires very exact measurements. I am not good at just throwing something together without a recipe. Good thing Tony is good at that so we balance each other out. 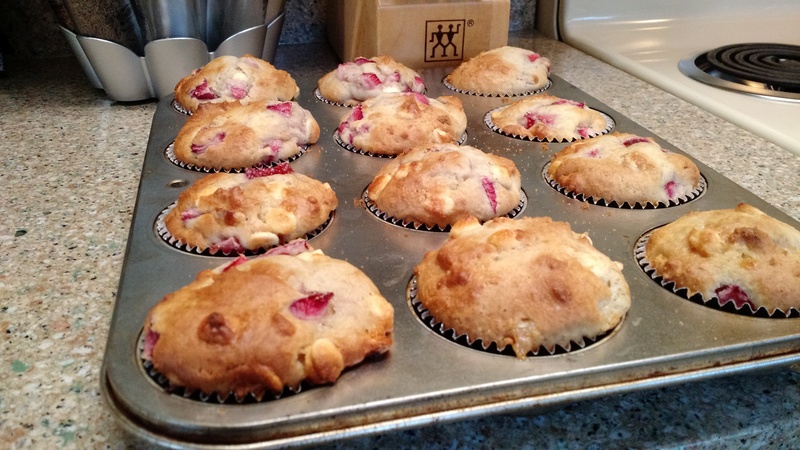 Last week I made these strawberry muffins and they turned out really good. They were not hard to make and somewhat healthy (although I did add some white chocolate chips to them). Every once in a while you need a little chocolate – or in my case at least once a day. Here is the recipe if you want to make some. You don’t have to add chocolate if you don’t want to. We have also been starting to Spring clean a bit – as much as you can do as a parent. While cleaning out the pantry (very slowly) we found that we have a bunch of butternut squash soup that I thought I would enjoy but it turns out that neither of us like it. So last night I decided to freeze it in ice cube trays so that we can heat it up a little bit at a time for Owen. As it turns out he doesn’t hate it. Yay for Owen not being picky yet. Lately Owen has not really enjoyed baths, and we weren’t sure why. So Tony decided that it might be that he is too cold while getting a bath in the sink. So recently we’ve been bathing him in the big tub without a smaller baby tub (just a rubber mat). I think that did the trick. Both times so far this week he has really enjoyed it. He may be getting more water out on the floor by the end of it, but at least he isn’t screaming. He even pulled himself up for the first time on the edge of the bath tub. Of course he would choose to pull himself up in the most dangerous environment he could choose. By the way, I’m finally catching up with the times and joined Instagram. I am still getting the hang of it, but if you are interested you can follow me here: @countdowntocuteness.